Season the hake with salt and pepper. Warm the oil in a large frying pan set over a medium heat, then add the hake and fry for 4 to 5 minutes on each side, until cooked through. Remove the hake from the pan and keep warm. Bring a small pot of water to the boil. Snap the woody ends off the asparagus spears and discard them, then cut the asparagus into 2.5cm pieces and cook for 2 minutes. Drain and set aside. Put the butter, parsley, lime juice, capers and asparagus in a clean pan set over a medium heat and allow the butter to melt. 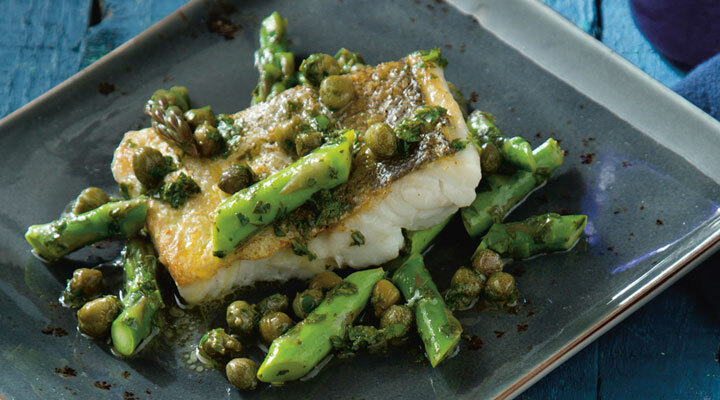 To serve, place a fillet of fish on each plate, then spoon the asparagus, capers and melted butter over the fish. Serve with plain boiled baby potatoes and a pinch of sea salt.